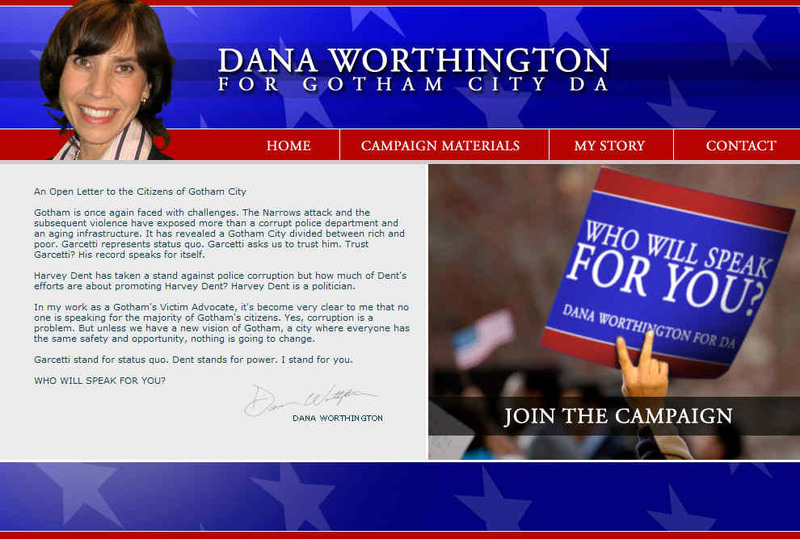 From March 26, 2008 update on Thegothamtimes.com, GVAFoundation.org president Dana Worthington is revealed as the third candidate for Gotham City DA, joining Roger Garcetti and Harvey Dent in the race. Gotham is once again faced with challenges. The Narrows attack and the subsequent violence have exposed more than a corrupt police department and an aging infrastructure. It has revealed a Gotham City divided between rich and poor. Garcetti represents status quo. Garcetti asks us to trust him. Trust Garcetti? His record speaks for itself. Harvey Dent has taken a stand against police corruption but how much of Dent's efforts are about promoting Harvey Dent? Harvey Dent is a politician. In my work as a Gotham's Victim Advocate, it's become very clear to me that no one is speaking for the majority of Gotham's citizens. Yes, corruption is a problem. But unless we have a new vision of Gotham, a city where everyone has the same safety and opportunity, nothing is going to change. Garcetti stand for status quo. Dent stands for power. I stand for you. Want to help put victims of crime first? Then join up with the Dana Worthington campaign. Head on over to the headquarters and pick up buttons, stickers, and lawn signs. I grew up in Pettsburg. My dad started out as a machinist for D.L. Metals and Parts (now Gotham Tool and Die) my mom was a stay at home mom. My little sister Julie and I were Gotham Girl Guides (my mom was a troop leader.) We had a cat named Sneakers and a hamster named Jumble. I was in college when my mom called me and told me I needed to come home that night. I drove home from school. My mom sat me down at our kitchen table, at the plaid placemats where we ate dinner as a family on Sundays, and told me that my sister, Julie, had been assaulted, in the parking lot at the mall where she worked at a music store. I can't say that I found my life's calling that night. I can only say what every victim, and every victim's family says. That night everything changed. You walk into that conversation one person, and walk out another person. What happened to my sister was awful, but what happened after that felt even worse. Her attacker was caught. My seventeen year old sister bravely identified him from a line-up. She testified in court. And he was in jail for eighteen months. Her assailant, who had a court appointed lawyer, got his GED while he was in jail. He was required to attend a substance abuse program. And my sister? My sister had anxiety attacks. She found it harder and harder to leave the house. She broke up with her boyfriend. She graduated from high school, but couldn't bring herself to go to college. When she tried to take a tour of Gotham University, she had a panic attack in the parking lot. My sister got counseling, with the help of my family, and today Julie is a speech therapist. But as I have found, for many victims, things don't turn out so well. Thank you for your interest in my campaign. We are a small and independent operation, and we can't answer all emails personally, but your support is important to me. Your email will be read. Your vote will count. Hello. I’m Dana Worthington. I just wanted to say a couple things about the political shenanigans going on right now. My two opponents are locked in a mudfight. Dirty attacks are flying, and both of my opponents are more interested in making political points than actually helping Gotham. Are you sick of these kinds of dirty tricks? This type of old politics is exactly what’s ailing Gotham. We need new politics. We need someone who is interested in making Gotham safe, not attacking their political opponents. My friends, that person is me. Please help me become District Attorney of Gotham City, and I will not let you down. PS. Somebody left a blue wool sweater at my campaign offices. I know it’s probably very expensive, so come and pick it up! I’m keeping it until you come! The citizens of Gotham are smart. You really, really are. I’ve met so many of you in this campaign. And it has made me realize that you do see what’s going on in Gotham City. You know that I have been a tireless supporter of victims’ rights for decades. I speak for those who have no voice, I fight for those who are weak and I stand up, time and time again, against politicians like Roger Garcetti and Harvey Dent who have led us into this mess. I’m not a politician, I am an advocate for all the regular people in Gotham who have been wronged, hurt, and overlooked by the politicians in power. I do not like to speak badly of people, but I must admonish the name-calling between Mr. Dent and Mr. Garcetti during this campaign. Where is the positive exchange of ideas from elections past? The spirit of camaraderie? The idea that the best person should win? I know one thing. Gotham wants to restore a sense of justice and honesty to the office of DA, no matter who gets elected. But, if that person should be me, I promise to build all of us up without tearing others down. Thanks, and hope to see you at the campaign headquarters! Thanks, and make sure to vote your conscience. Well, it looks as though the race for DA is down to just two candidates: Mr. Garcetti and me, Dana Worthington. Harvey Dent has been a worthy adversary, but where his campaign has lost momentum, mine has only been picking up. We're definitely not the favorites here. But our campaign is full of the kind of energy and enthusiasm that the best come-from-behind campaigns have. And although my opponents have much longer careers in politics in Gotham, we have picked up some great endorsements, including the Gotham Teacher's Union, Gotham Local 184, and an official endorsement from the Gotham Woman's Daily. So, despite rumors that Garcetti is a "mathematic inevitability" to win this contest, I have no plans of conceding to him. Now, the choice is clear: do you want Gotham politics to continue sliding downward into the chasm of hopelessness and despair? Because, if you do, you can vote for the status quo. But, if you want a fresh tomorrow, filled with promise and light, then cast your ballot for the one candidate who represents the underdog: Me, Dana Worthington. Together, we can rebuild this city. Everybody is talking about the events at Rossi's Deli on Sunday. I want to be the first to commend Harvey Dent for his bravery, courage, and compassion. Even in the middle of a hard-fought campaign, I think it's important to acknowledge true valor. What Harvey Dent did by putting himself at risk to free that poor, poor woman is something all Gothamites can be proud of. Thanks to him, the hostage, Jenna Hanover- Oates, was released alive and well. She is a true survivor, and on that day, Harvey Dent became a true hero. But one woman did not survive. Mary Breitup. Every death of a fellow human being is like a little death of all of us. Even if we've experienced terrible and tragic deaths, it never gets any easier. I'm so sad for the Breitup family. My heart goes out to the Breitup children. Who will stop this madness? When will it ever end? We don't know what happened inside that deli. But we do know that there was yet one more victim left dead, Mary Breitup, beautiful, tragic, hard-working Mary Breitup. What a tragic tale she tells, losing her handsome husband Karl to the shoot-out at Betty's House of Pies and then losing her own life at Rossi's Deli. And the children suffer most of all. Who will take care of the children? What will they remember of their parents? If I could have reached out to Mary, if I could have contacted her, if I could have whispered in her ear, "Go! Save your life! Go hug your kids!" I would have. I would have done everything in my power to get through to her, to save her from the twists and tragedies of fate. But we live in Gotham. All of our lives are hanging on a thread. This is certainly no time for politics. But if you vote for me, I will work my heart out to make sure there are no more victims like Mary Breitup. One of the true pleasures of running for elected office is getting the opportunity to meet remarkable citizens like you. Well, I want you to know: Dana Worthington is listening. If you don't believe me, just ask Bethany Hollingston. Beth was accosted on the street right in front of her home. Beaten, robbed and left for dead, Ms. Hollingston came to my shelter seeking some basic human compassion, but I gave her so much more. After nursing her back to health, my organization found a position for Bethany, and she is now the senior VP of my campaign for DA. I couldn't do it without you, Beth! I would also like to commend Harvey Dent for his courageous behavior in the hostage crisis at Rossi's Deli. I believe that I am still the better candidate for District Attorney, and I hope you see that until we get the politicians out of City Hall, nothing will change. It's not my job to tell anyone how to vote. I haven't endorsed any candidate in any race, and I've been largely silent about the 11 propositions on the ballot, believing it up to the citizens of Gotham to make up their own minds. After a great deal of inner wrangling, I have decided to reverse this principal when it comes to Proposition D. Too many people have asked my opinion on this, and it may very well be the most important decision voters face after the mayoral and D.A. races. The people who argue against the Batman say that vigilantism is a crime. I disagree. While specific acts done in the name of vigilantism can be crimes, I admit that the act - in principle - is legal. When the government fails to live up to its bond with the people, the people have a right to act for themselves. In fact, I believe they have an obligation to do so. Some also argue that the Batman is a criminal. This is patently untrue. There have been no credible reports of the Batman acting in any way other than to uphold laws ignored by our government. Was the Batman acting as a criminal when he saved people who attended the Djepelgesh Festival? Without his efforts, dozens of people would have died from mob gunfire. Who is the real criminal here? Batman or a government that sat by while Gotham descended into a living nightmare of crime and violence? Then there is a camp of people who say the Batman is dangerous, that someone is going to get hurt. I can only judge with my own eyes, and from what I've seen, the Batman is a highly skilled individual who displays a great deal of competency in what he does. This line of argument also suggests that it's better to let an innocent person be murdered than to risk getting a scratch should the Batman intervene. Because of all these things, I feel that I can make a slight exception to my policy. I am not going to come right out and tell you to vote "yes" on Proposition D, but I think it's a pretty darn good idea. The election is just around the corner. When I walk around our amazing city, talking to people about whatever's on their mind, I can feel a real excitement in the air about this race. It makes me proud to live in this country, proud to be a Gotham citizen. People care about this city like it's a living, breathing thing. But like all living things, it can get sick and sickness isn't pretty to look at. Sometimes, people wait until they're forced to and when they do, they find out things aren't as bad as they thought. No one doubts that Gotham is sick. But people are finding that things aren't as bad as they thought. I don't mean that our streets are safer; I mean that people are discovering their own power, and it's this very power that will bring a whole lot of change. Regardless of which candidate you support, this election has brought our friends, family, coworkers, and neighbors together in a way I haven't seen in years. And that is a powerful force. Whoever wins this election, I know in my heart that this person will do everything in his… or her… power to use this force to help every wonderful person in Gotham. Election Day has come and gone and I'd like to say a hearty "congratulations" to Harvey Dent for winning this breathtaking race. Right now, I could not be more proud to be a Gotham citizen. The election process worked, and I humbly submit that Mr. Dent ran a marvelous campaign and that he will be an even more marvelous District Attorney. For me, I now return my attention to serving the victims of violent crime with the hope that one day, my services will no longer be required. Let us all work to support Mr. Dent in his drive to stop this scourge of violent crime. Thank you to all my supporters - I love you! After the countdown ended on Whysoserious.com/Overture, Danaworthington.com was "Jokerized," along with nearly every other website in the game. This page was last modified 18:13, 24 April 2012.